Compete in this spell casting challenge from the legendary wizard Merlin! 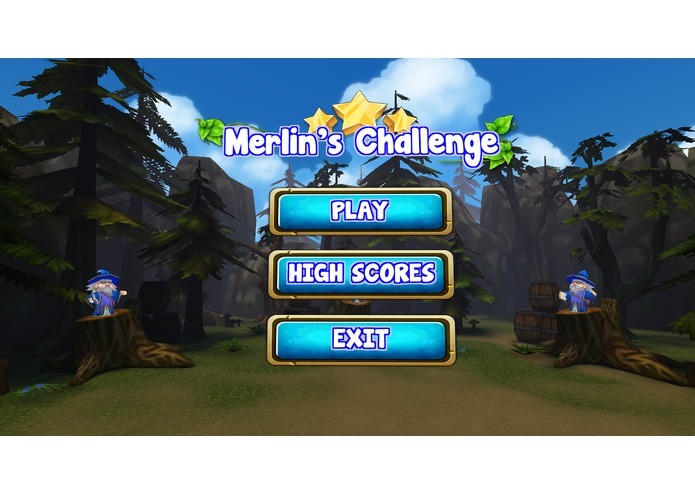 Merlin’s Challenge is an arcade style single-player game designed for the Samsung Gear VR. 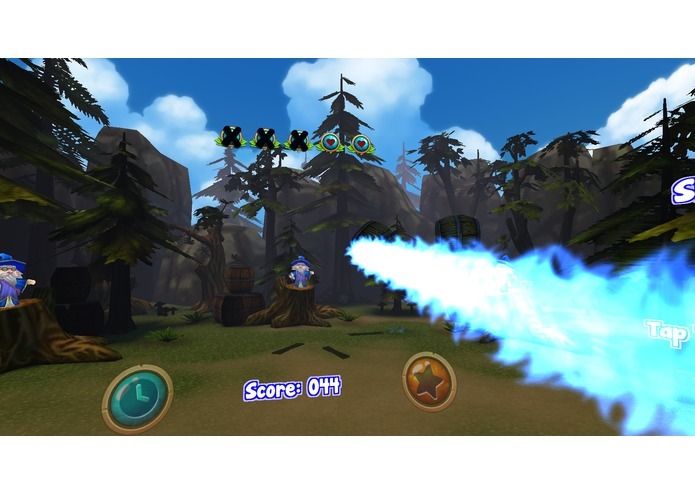 The player plays as an apprentice mage who is competing in a challenge set forth by the legendary wizard Merlin. The player is located on a rock facing away from a small town, and towards a training area set within a group of trees. 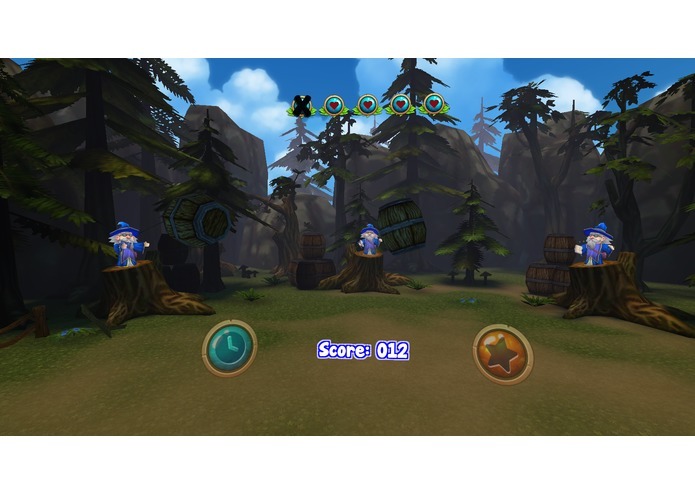 In the cove, there are three wizard trainers spread evenly on the edge of the forest. 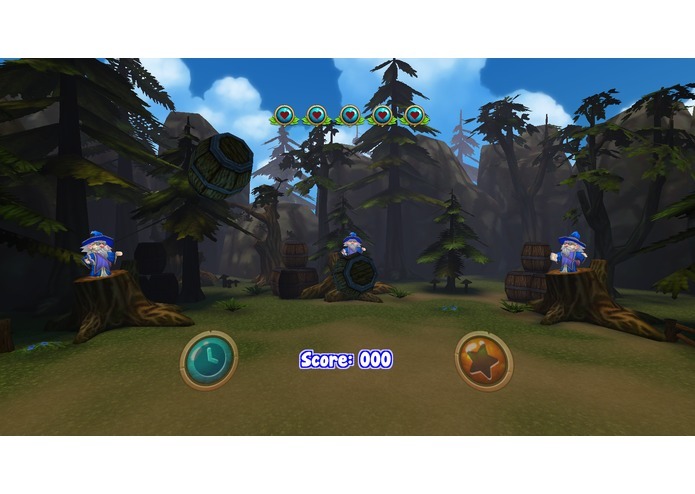 When the game begins, the three wizards start casting barrels in the air, towards the player. 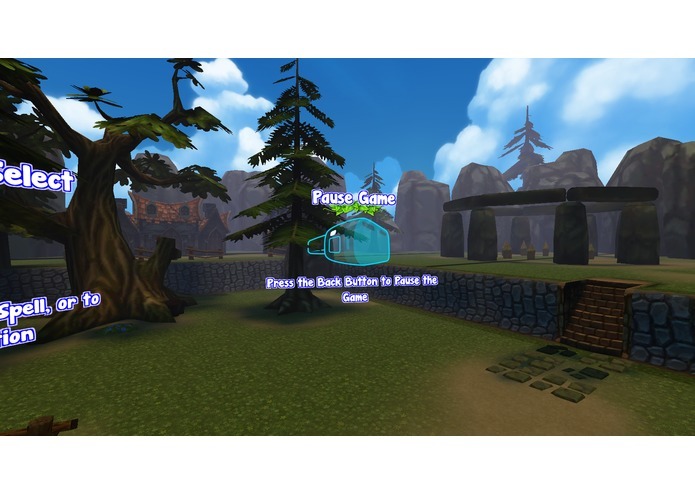 The player then aims at the projectiles by looking at them with the VR headset, and then casts a projectile spell by tapping the touchpad. The number of objects being thrown and the speed at which they are thrown will increase as time progresses through the round. The round will end when five barrels hit the ground. 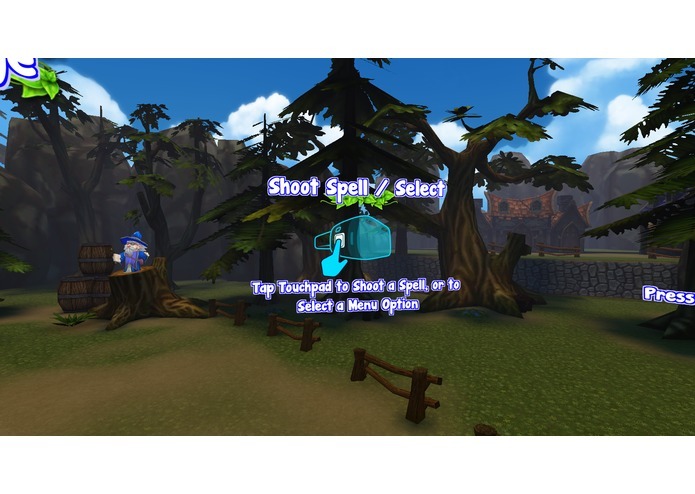 There are also two single-cast spells that the player can gain during gameplay. 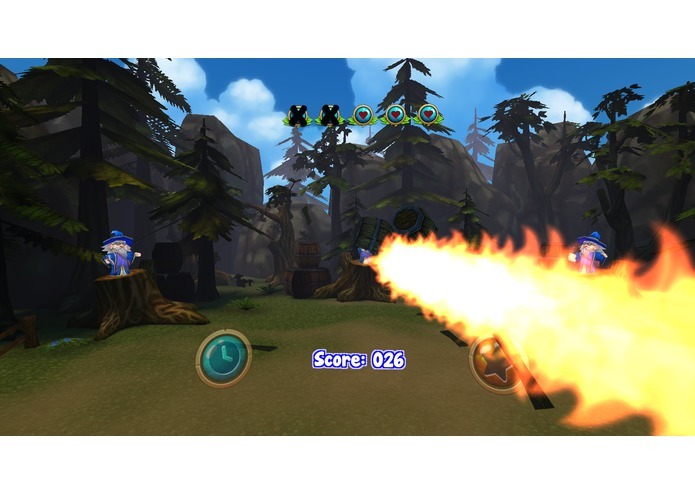 One will allow the player to slow down time, and the other will give the player the power to shoot a fast stream of fireballs toward the targets. The goal of the game is to get the highest score possible. 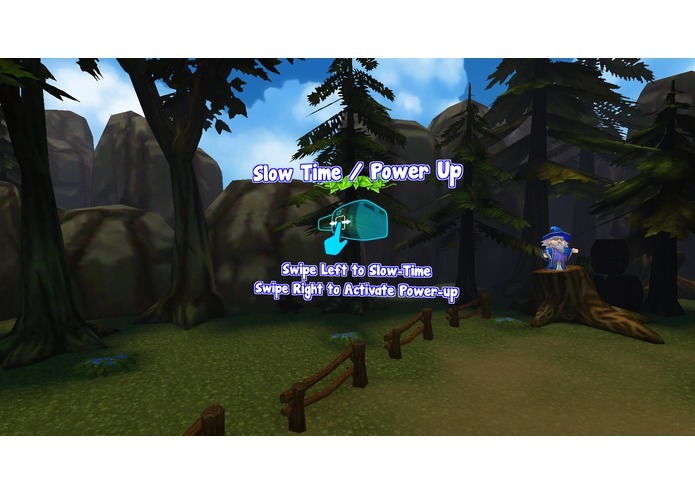 The player can look around the environment to find UI Elements explaining all of the controls for the game. 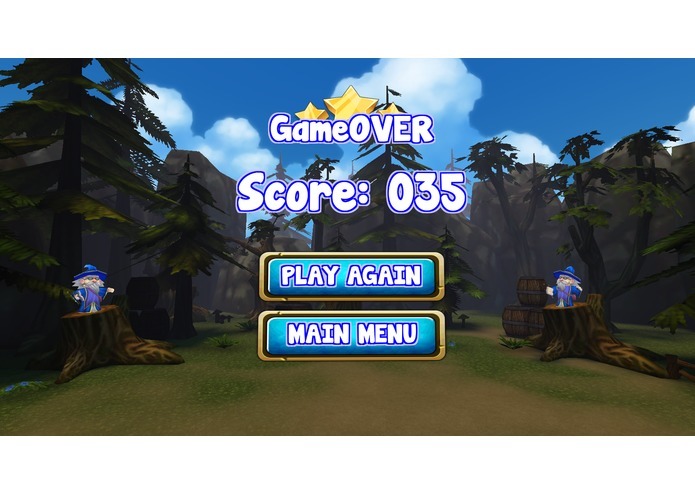 When the player has started the game, there will be 5 heart indicators above the gameplay area which indicate the number of barrels that have hit the ground. When a barrel hits the ground, an X will appear on one of the hearts. When all 5 have X's, the game will end. Also in the UI, there are three indicators below the gameplay area. The far left indicator is a blue circle with the image of a clock on it. This indicator will light up when the player has hit enough barrels to earn the "Slow Time" ability. The indicator on the far right will do the same for when the player has hit enough barrels to earn the "Power Up" ability. 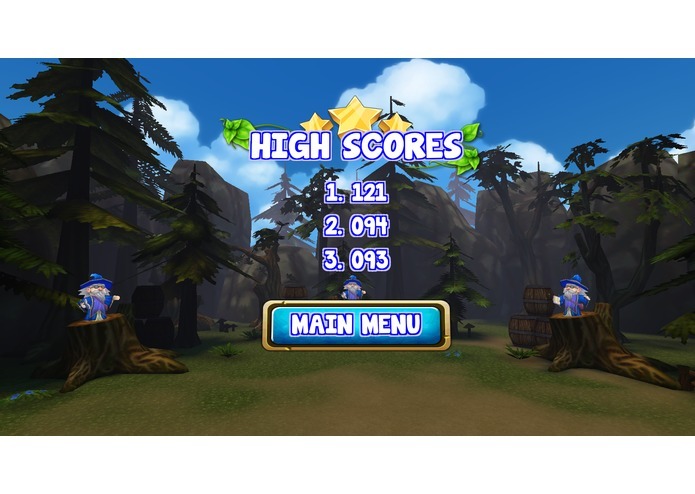 The indicator in the middle will display the number of barrels that the player has hit. 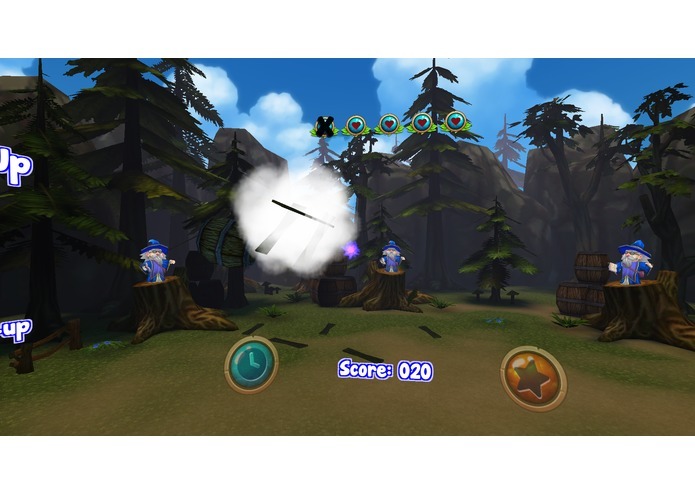 The objective of the game is to use fireballs in order to destroy as many barrels as you can before they hit the ground. The game ends when five barrels hit the ground. 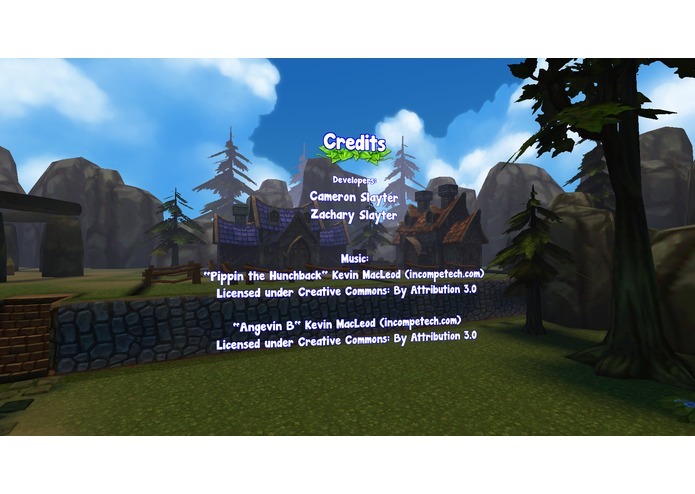 UI – All UI elements are placed in the scene, making it ideal and easy to use with the VR Headset. This game was built from the ground up with the Samsung Gear VR in mind at every step of the process. One of the goals for this project was to create a game that is a truly comfortable first time VR experience. The hope is that even people who are extremely prone to motion sickness will be able to play this game without any problem. We are accomplishing this by having no player movement, the player will be in the same spot during the whole game. Although we restrict the player's position, the head movement is not restricted at all, so the player can look around in 360 degrees. Gameplay will also be restricted to about a 90 degree FOV from the player position, so that the player doesn't have to do too much head movement. We also want to create an easy to learn control system that makes use of the touchpad on the side of the headset and/or the controller without getting too complex. Another goal that we had, was to create a UI system that is easy to pick up. We wanted it to be familiar to UI experiences in games that aren't in VR so that people who love playing games will know what to do from the start. Mobile Optimization – We spent a lot of time during the Jam ensuring that the game would run well on the Samsung Gear VR. It was challenging, but we learned a lot, and we are very happy with the result. 1 Month Time Frame – Obviously, this is a challenge that everyone had, but it’s still one of the biggest challenges. At the beginning of the Jam, we had nothing. Not even a complete idea. Going from nothing to a complete, polished game in one month was definitely a challenge, but we are very proud of what we accomplished.